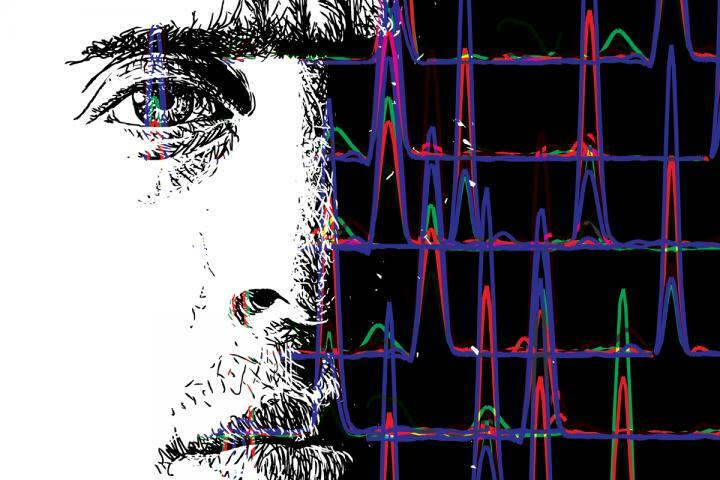 This is an illustration of SRM peaks and a human face. Reporting in the journal Cell, Senior Research Scientist Dr. Ulrike Kusebauch, of Institute for Systems Biology (ISB), describes the results of a collaboration between scientists at ISB, ETH Zurich and a number of other contributing institutes to develop the Human SRMAtlas, a compendium of proteomic assays for any human protein. The Human SRMAtlas is a compendium of highly specific mass spectrometry assays for the targeted identification and reproducible quantification of any protein in the predicted human proteome, including assays for many spliced variants, non-synonymous mutations and post-translational modifications. Using the technique called selected reaction monitoring, assays were developed with the use of 166,174 well-characterized, chemically synthesized proteotypic peptides. The SRMAtlas resource is freely publicly available at http://www.srmatlas.org and will equally benefit focused, hypothesis-driven and large proteome-scale studies. We expect this resource will significantly advance protein-based experimental biology to understand disease transitions and wellness trajectories because any human protein can now, in principle, be identified and quantified in any sample. The ability to reliably and reproducibly measure any protein of the human proteome in any tissue or cell-type is transformative for understanding systems-level properties as well as specific pathways in physiology and disease. In the lab of Professor Robert Moritz at ISB, a collaborative effort enabled the generation and verification of a compendium of highly specific targeted proteomic assays by the method called selected reaction monitoring, or SRM for short, now provides quantification of 99.7% of the 20,277 annotated human proteins by the widely accessible, sensitive and robust targeted mass spectrometric method selected reaction monitoring, SRM. This Human SRMAtlas provides definitive assay coordinates that conclusively identify the respective peptide in biological samples. Although the accomplishment of the Human Genome Project in 2003 in creating an inventory of all human genes, the majority of protein research is still focused on the same relatively small subset of proteins that were explored before the human genome was mapped. To move beyond this stagnated proteogenomic research approach, the development of highly specific assays for essentially every human protein was needed. With a resource such as the Human SRMAtlas, the prospect of measuring any protein is now a reality. The Human SRMAtlas now provides verified MS assays based on SRM technology developed in a uniform and consistent process for essentially every protein of the human proteome. These assays can be rapidly deployed in systems biology and biomedical studies to identify and quantify any human protein with high sensitivity and high selectivity, and to navigate complete proteome maps to understand their biological functions. Personalized medicine will depend on molecular signatures to monitor health status and provide signals to identify changes in wellness trajectories and provide information to match the right patients to the right drugs, first in clinical trials, then in clinical practice. The Human SRMAtlas initiative pushes proteomics firmly into the forefront and provides further ammunition for proteomics to play a large role in increasingly worldwide efforts of the Cancer Moonshot. Page took 0.014700 seconds to load.